Here is a track I produced using only the SE-02 as the sound source. Ahmed is the score for my forthcoming love letter to the 3 Oscillator Analog Mono Synth (due any second now) exploring the arrival of this idea and its impact on the world from 1969 to the present tense. Since the SE-02 is a mono synth, and not only plays just one note at a time, it is also mono-timbral (which means it only makes one particular sound at a time) so naturally I needed to multi track this piece in order to record all the parts, but each part respectively is a sound coming from the SE-02. No other effects or instruments were used to compose, to record or to perform it. It is my wish that this inspires you to do better, to reach deeper, and blow my little electronic jazz tribute so far out of the water it’s just silly… dig? 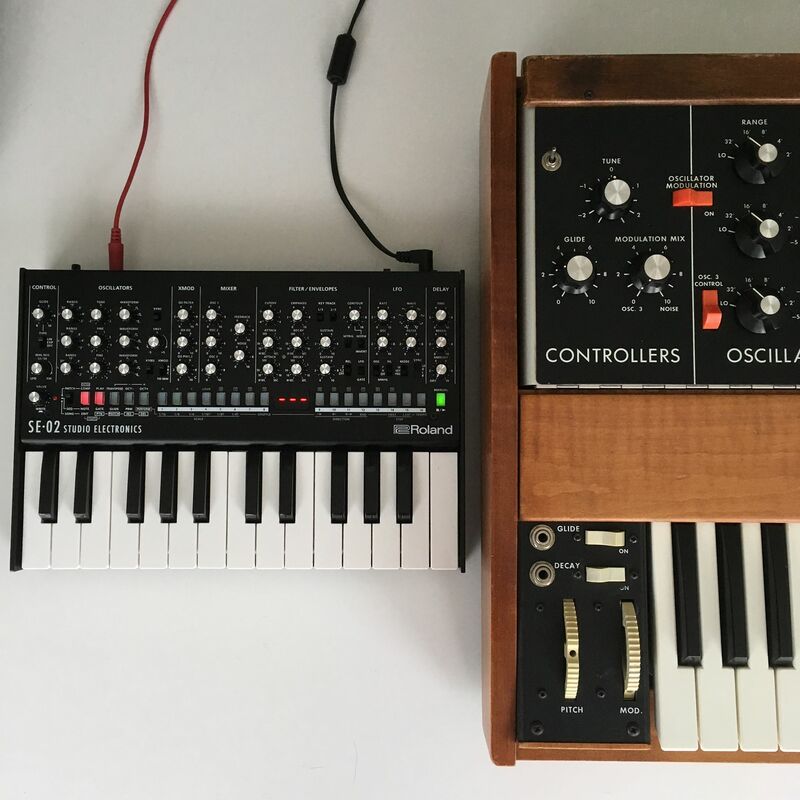 I have also included a selection of patches for you to play with in order to see how easy patch sharing can be, and also to discover how amazing this little analog synthesizer really is. I programmed each of these sounds in MANUAL mode, from scratch. They are not based on any of the presets contained in the SE-02. These are all sounds used in my track Ahmed. Thus you can have every element used to produce a complete idea for yourself to deconstruct, refine, and perfect. NOTE: There are two other sounds used in the track, but they’re existing presets and I saw no reason to create duplicates in your system so they are not included here. Please be sure to backup your existing patches before writing to memory. In the BACKUP folder the patches are numbered differently than the other Boutique synths. For the SE-02 they are actually numbered 1-16 and the patterns are as well. There are also fewer files to worry about as the SE-02 only offers one user bank to write your 128 user patches into. NOTE – Be sure you backup SE02_PATCH1 – SE02_PATCH6 BEFORE you begin this exercise. In accordance with the new, clearly written manual on page 9-10, follow these instructions to backup your sounds before you begin. 1. Use a micro USB cable with a standard USB connector on the other end. 2. Connect the micro end to the SE-02 and restart the synth holding down the  button. 3. Lights will dance, this means the SE-02 is awaiting connection to the computer. 4. Connect the USB cable to the computer and a drive icon named SE-02 will appear on the desktop. It takes a moment, so relax and trust that all is well. 6. Create a backup folder for your sounds, and drop them all onto it and copy them over to your desktop. This is in case something goes wrong, or it get’s all messed up, or weird, you can always just go back. 1. Follow the procedure above (steps 1-5) for mounting the SE-02 to your desktop. 2. Copy the contents of the PATCH folder you downloaded from me into the PATCH folder. * NOTE: The 128 patches within this folder reflect the USER Banks. The factory patches can not be overwritten. 4. Before power cycling the module note that all buttons are blinking Orange. 5. Once confirmed you may power cycle the SE-02 and disconnect the USB cable and you’re done. Play a note on your keyboard. This should be the 3 OSC CHORDS patch I gave you. Refer to the legend above to see what I was attempting to create, and enjoy, modify, or discard these patches. They are yours to do with what you will. The idea here was not to style you out with some heart stopping freebies to make me look cool, but rather to engage you with your own equipment, and show you just how easy it is to save, backup, and share patches for these amazing little synthesizers. I hope you dig it, and are already planning a huge patch swap in the very near future. Here they are in a collected zip archive for your pleasure. Perhaps this makes it easier to mix and match, or to have a stable backup archive of all the factory sounds in case you need them. I hope you enjoy these manuals. I hope they inspire you half as much as it has inspired me to make them for you. I do this for love. I wouldn’t accept money for it. You’re on fire! Thanks for these. Love you my friend. Your contributions to music in general and our mutual love for Roland synths in particular is invaluable. thanks i picked mine up last friday!!! its sooooo PHAT!! Thanks! The Roland Manual is terrible! @Shawn – I am also pretty uninspired by the current form of “leaflets” that come with the new Roland instruments, and yet I’m just wild about these synths. It’s why I decided to undertake this project. My aim is to take the information and illustrate it so that the of us who take little inspiration from spreadsheets, and data can learn and explore and find out about synthesizers without feeling like complete idiots. I hope this edition assist you in so doing. Again, thank you! This is unbelievable … it’s even not official delivered and we got an extended user manual! Thank you! Love you too!!! We can feel the love. Don’t stop, Don’t stop! I found a Copy/Paste mistake. It’s edited and updated now. Thanks! …front panel of the SE-02 are cable of transmitting via MID for recording into a DAW or MIDI sequencer. @ Steve – Found it! Revised to Version 0.04C! Dope. Now if my order would arrive sometime soon. @Brandon Heinz – I love the SE-02. It’s sitting here on my desk beside a 1972 Moog Model D. I’m not saying that I would choose the SE-02 over the Model D (ever.) But I love the SE-02 and it holds its own up against the source of its inspiration. You sir, are a fine human. This manual, at least to me, is vastly superior to the official one. Incredibly useful. Thank you. This guide answered all q’s I had about this gem. Time to cross mod with other cv/trigger/gate pals. I owe you some Philz and avocado toast when down in SF. Have you noticed any stranger behavior regarding tuning on the SE-02? I have noticed that when I get “C” in tune in one octave it often is out of tune at other octaves. Also I’ve noticed my “G” seems to always be flat relative to the “C” – this is even after I have performed the tuning procedure you have outlined in your manual (which I thank you for by the way!!!). Thanks for these amazing manuals. I have the JU-06 and am considering the SE-02. FYI: The above patch download link is pointing to the wrong file. @Steve Cooper – I did notice this. I got ahold of an update which allows for CV fine tune, and also some other adjustments. Since performing that update tuning, and other minor issues is fixed. I expect that update to be available soon for everyone. Also: The update procedure has been added to my manual including a retuning procedure. I’ve noticed that after the update, it’s important to restore factory settings, and tune the oscillators twice (the second time is the one that does the good things) after the update. Seems trivial and shouldn’t make a difference, but it has made a difference here. Does the key trigger mode in the sequencer mean you can transpose the whole sequence by hitting a key on the keyboard like an sh-101? Probably the best manual I’ve ever read!! Thank you for taking the time to help me get the most out of this synth. @KINGMOB – Unclear. The short answer is no – with workarounds. First: Trigger mode is actually just the gate in and out of the sequence and the notes played. Sending a gate clock into the trigger input will advance the sequencer when it’s set to sync to trigger. So any gate rhythm then becomes the clock. Second: Transpose is interesting on the SE-02. You can transpose the sound up and down an octave and also up and down by notes using the controls in Patch mode. Thus you can accomplish this via midi commands. But I haven’t been able to determine how to do this by playing the keyboard yet. It’s a good question I’d really like an answer for, so I’ll explore, speak with SE and find out and report back (and update the manual) because this is actually really important to know. I spoke with Studio Electronics today and they had all sorts of insight and good news which we can talk about, but the question of the Sequencer is that SE worked hard to deliver Song Mode, and a really functional sequencer, and the rest of it is Roland. The System-8 Sequencer is essentially the template for this basic function. The System-8 sequencer CAN transpose the sequence via the keyboard. So since the SE-02 has access to the octave and note transposition we suspect that this is possible as it is. It’s simply undocumented as yet. So I’m going to track this down, not just for you, but for everyone (and because I would really like to see this happen myself.) And once I determine the operations to accomplish this I will add it to the manual and document it. IF this has been omitted from the SE-02, then the St. Regis brothers assure me that it’s probably a matter of a couple of lines of code and it will be added to the 1.05 update (which includes some great things such as CV tune, and a terrific improvement in the top end as well) which I’ve been working with already. And continued support of the product and more. Hope this makes you as happy as it makes me. Check my instagram (photograph link at the top of this page!) I’ve done it. In the sequencer setup – option three is Key Trigger. Set this to how you’d like to trigger your sequence and voila! We are playing it on the keyboard. I’ve filmed the breakthrough on my phone and posted it to instagram for you to see if you’d like. Thank you for your informative manual on the se-02. Its really helped me to find my way around my new acquisition. 1) If I set the LFO to control the amp envelope (instead of the gate), then set LFO from free or key to “1-shot”, I observe I don’t get “1-shot” of envelope at all- it just keeps going. Also, if I then move the envelope control back to gate, but leave the LFO on “1-shot” then the LFO continues to behave like its in key of free mode – I have to move the switch from “1-shot” back to key then back to “1-shot” for it to work correctly again. Is this intentional, or is it a F/W bug do you think? 2) Both the official manual and your manual mention that the LFO can be used to set up tremolo using amplitude modulation. However I don’t see a direct way to do that? Do you know how to achieve that, apart from the aforementioned switch, which does not appear to work in the way I expected. @Chris – Totally… both the XMOD and the LFO routing is a little counter intuitive and fiddly. It’s true that my version of the manual fails to interpret these details sufficiently. He covers the routing oversight really well, and shows us all how it’s done. Sunshine I love your manuals. But it’s killing me to see the word “OONTROL” at the top of every image of this beautiful little synth. @Tony Collins – Ha ha! Yes how terrible. It’s actually spelled correctly, but the “better” setting for the images in my PDF formatting process just isn’t good enough. Thanks for posting that awesome SE-02 User’s guide. When I lived in SF in the 1990s, I caught Dubtribe Soundsystem more than a few times. Always a great time at those parties. If I connect a synth into audio input will that get routed through usb into daw? @Sean N – Yes. The external audio input is routed to the output. If you are using the USB audio through your DAW then whatever you send into the input will come out the output. But consider that the input is routed through the filter, so unlike the other Roland boutique synths it is great for filtering and effects, but it’s not ideally suited for chain mixing. Thanks for writing the more detailed SE-02 manual. I don’t own one, but I’m interested. Can you clarify what exactly can be modulated with velocity? I’ve only really seen hints about it having velocity response, nothing concrete. What can velocity be mapped to, and how much can it be adjusted, if at all? I did a quick keyword search of your manual, but I couldn’t find anything about that. @ Andy H – It’s true, I omitted any velocity curve features. Truth be told, that’s not an aspect of the SE-02 that I’ve delved into. I’ll take a look at it, and describe my findings here, and then if appropriate, revise the manual for you and everyone. Currently, velocity is routed to filter contour. In the patch set up page, it is button number 5. Thanks for doing this manual! I can’t stand the fold-out maps/leaflets Roland’s been passing off as manuals lately. If they’re going to cheap out on the printed paper version, they could at least make the downloadable PDF version a normal document with pages. Panning/zooming on the PDF version of one of their ‘map’ manuals is a usability disaster due to all the vector elements that need to re-render with each move. Anyway, maybe it’s just macOS Preview rendering the PDF poorly (?) but in my copy it seems like the second page of MIDI implementation, i.e., the page with all the CC assignments, is missing. It looks like it’s supposed to be on page 37 and there’s even a reference in the chart on page 36 (‘refer to next page’) but I’ve just got a blank page 37.
this feature or is this a problem with the se 2? The settings are a little tricky, and at times confusing. But it’s all there. As Stevie already put it: you are the Sunshine of my Jones, thanks for the awesome manual. Might not be a bad idea to refine and point this out. This isn’t clear. I encountered this here https://instagram.com/p/BX1ZoJhnsKo/ and found a little workaround, but sort of believed there would soon be an update which might handle this differently. But it’s been a little while, and so maybe it’s a good idea to note all this now. This has been confusing for a lot of people. I’d like to take a look at it and clarify things if I can. At the moment I’m so busy, loads of travel, and pressure to be done with this LP I’m approaching the end of, but I believe I can make use of the other side of my brain here and there to produce a revision soon. Thanks for this! 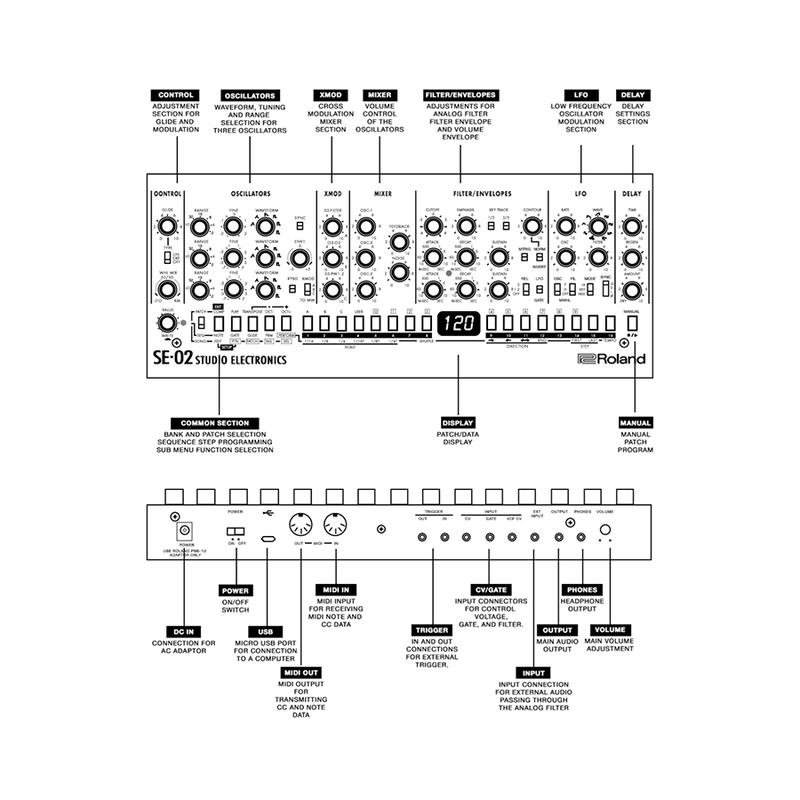 I did notice that you have the procedure for copying patches from your computer to the SE-02 wrong though… (this might just be a copy/paste from other manuals thing though… the SE is my only Boutique so I’m not sure what the procedure is on the others…) There is no RESTORE folder on the synth, so you actually need to mount it to your pc differently than when you are backing up patches. just press the 3 button (not 2) when powering up the SE-02 and it will put it in the mode where you can copy patches to the folders on the synth. So,  to move files from synth to computer, and  to move files from computer to synth. I just installed your patches and am having fun twiddling with them!!!!!! that lead sound is great. P.S. can you write one of these for the TR-09? I just bought one used and it didn’t come with a manual! The downloadable Roland leaflets are horrible!!!! Also an oversight regarding the Commodore VIC-20 has been addressed. This post is also corrected to reflect the actual patch backup and restore procedure. I deeply appreciate the support and encouragement for continuing to make these manuals. Means a lot to me, but really, I am glad to be helping my community make the most of their wonderful devices. thank you very much for this Update and the whole effort doing an alternative manual for the community. In conjunction to your words above (“… you can have every element used to produce a complete idea for yourself to deconstruct, refine, and perfect.”) I copied each pre-programmed Factory Patch (from Bank A,B and C) to the User Bank D and backup them to a local folder on my laptop. Maybe a little bit stupid (and boring too) because of ROLAND’s announced DAW integrated editor who will at most show the exact tweaks of every knob indeed. @Analogflatulenz – Please feel free to send them to me, and I’ll link a zip archive of them to this post. I haven’t read about the DAW editor, I suppose I’ll have to go and check it out, but I doubt that it will be all that interesting to me, as I don’t use a DAW for anything. So patches, and the ability to check them out remains very interesting to me, and I don’t think we are alone in doing things without a computer. Please send them along and I will include them in this post. Rename the extension to .txt and open. @FaSid303 – Does this mean text editing patches? Does it work when you adjust the text document, and rename it and reload it? That’s a pretty cool discovery! 3) Perform the Tuning Calibration again…..
1. Disconnect the SE-02 from any external device. I know this isn’t really fundamentally important with something as modern as the SE-02, but it is analog. So personally, I would warm it up. The in tune state should be pretty close to 12 o’clock. Then I would turn down Osc 1 and turn up and tune Osc 2, and repeat the same procedure for Osc 3. 5. I would check to be sure nothing is influencing the OSC modulation – all XMOD knobs are at 0, and no LFO is assigned to pitch etc. 1. If any of this has corrected the tuning issue, then hurray. But also boo… because now we have corrected the tuning for the SE-02, but we have not discovered the cause. I would take a look at the midi channels you’re using, and how things are cabled, and what’s being sent where. It sounds like something is sending out a message at some point that’s freaking the SE-02 out. We want to find this and make it stop. 2. If any of this does not correct the tuning , then I would get in touch with Studio Electronics. Roland are wonderful, I agree, but they are also a large company and so the people you get to speak with are often a support team who are responsible for all sorts of people and all sorts of instruments. The database is only as helpful as the data entered into it, and that’s what the good people are Roland support are working with. On the other hand, Studio Electronics are a small company, very very good people, and they designed this wonderful synth. I’m sure that they’ll want to know all about this, and will certainly help you address it. I love my SE-02. I play it in manual mode in my studio work, and in my live performances and ask quite a bit of it, and I haven’t had any tuning issues which weren’t the fault of my own excitement, or mal adjustment of the LFO, XMOD or OSC tuning. It’s been a solid staple of my work since I scored it. So it would be very interesting to know what culprit is here. Please follow up, and please report back how this unfolds. I care, and am very interested in your adventures from here. @Analogflatulenz – That is so awesome. Right on. Thanks for the reply. I did all that you mentioned and Loved my unit. I called the awesome guys at Sam-Ash and told them what the problem was I was having. They said they had two more in stock and I could swap it out. So I did. The new one has not replicated the problem. I did however come upon a post from someone else having the same exact issue on “Gearslutz” forum. I will send them here for your instructions. I love the SE-02 and look foward to whatever you wizards come up with next. Thanks a million and a half. @BC – I’m so glad you have it worked out! That’s great news. Hey Sunshine, wanted to share an accidental discovery with you regarding the SE-02. Not sure if you noticed, but Song Mode plays through the sequence patterns assigned to it, then comes to an end when it finishes the last pattern. This is a bit of a bummer if you wanted to use it to endless play a variety of patterns while jammin’ along. But I discovered this: put the SE-02 into Song Mode; edit the Setup of the Song (EDIT + PTN); press button 4 for KEY TRIGGER, and set it to ON or TRN. Now the Song will play when you press and hold a key, all the way through and loop back to the beginning and keep playing as long as the key is pressed (I use a guitar pick, of course!). @Robert – That’s a killer discovery. Well done! Thanks for the REAL SE-02 manual! I love manuals and read them like the morning paper! My first 3 osc synth, trying to figure it all out! @Paul – My pleasure to illustrate and re write the leaflet. A very meditative experience for a very busy musician like me. I’m happy to make things better and possibly more illuminated for everyone too. Thrills me endlessly. I’m glad you dig it. Hello Sunshine, There are a bunch of patches that play without touching the keyboard: such as C-29, 30, 52, 67, 68, 69, 70, 71, 72, 73, 74, 75. Is this something that should happen? A form of self-modulation? It happens when the LFO/GATE switch is in the LFO position. I’ve also discovered this (effect) when sound designing, and it’s aggravating to be playing and have the LFO continue to sound after you’re done hitting notes. Chris, in comment #45, I think also highlighted this problem in a different way. There seems to be a few quirks with the LFO/GATE and the LFO MODE switches. Anymore insight to this? Thanks! 1) In your SE-02 manual, in the “To bring patches from your computer into the SE-02” you need to mention that you must power up the unit and hold down  button…..not  as you state. The  button is for saving files (to) your computer, not retrieving them. 2) In the LFO section, you have the Filter/Envelops section highlighted in green. @Paul – Noted and now addressed! Good lookin’ out! Version 0.1C has replaced the previous version with corrections, graphic revisions, and minor formatting issues. Looking good. Thanks for the love guys. I’m impressed by your manuals! @Albert – NOTED and addressed. Hey, thanks for the awesome manual, that was awesome. I’ve read it all, but I still have a question: do you know if it is possible to loop in song mode? I would like to make a 64 steps pattern, but it seems it stops at the end of the song! (Also the Midi CC aren’t showing in your manual but I got them from Roland’s website so no big issue). @Renaud – That’s a GREAT question and also a well spotted oversight. I have already updated the User’s guide to now include the CC info that was missing, and I’m waiting to hear back from either SE or Roland about looping song mode. I picked mine up and spent some time with it, and I’m with you. Can’t figure it out. * fingers crossed for the good word * Looping in song mode would be very interesting and a great idea. More when I know more. Anyone heard anything about the VST/editor software? Also, not to complain, but I just downloaded 01C and still have a blank page 37 (MIDI CCs). Is this page displaying properly in some PDF software but not others…? Thank you so much for creating the SE-02 manual. The Roland manuals are a bit too minimalist in my opinion. thanks so much for the manual its really well done! @JG – Curious. They are appearing for me. I’ll check it out and upload a refreshed version. Song mode can not be looped. You must choose a start measure, and an end measure. The workaround is to copy your song from its location into the next one (and the next one, etc.) and play them in succession. It’s not a loop, but it has the same effect as looping. User’s Guide is updated to version 01D and now accurately includes midi CC Data for all formats (I typed them out to be sure they’d show up) also graphics are corrected, and minor formatting issues are also corrected. Just to confirm: MIDI CCs on page 37 are now showing up for me in macOS Preview, where they weren’t appearing before for whatever reason. real nice doc for a fresh SE-02 owner, great. One question, you are referencing in the SE-02 manual the 1.1 firmware upgrade, which enable Midi cc recording. The Roland web only shows firmware v 1.05. Where to find the 1.1 firmware? @Lothar – of course that’s a typo. I meant v 1.01, however the procedure is the same. how can I change the internal audio input routing? In the current/initial state my SE-02 don’t route the audio through the filter or the delay – it is just pass the filter and delay section. I have not found a description how to setup the audio input routing – can you give me a short hint? Wow, you know what? I have no idea. My external input routes to through the filter. And I haven’t found a way to re route it. @Diggnity – I just drove from SF to LA and thought about this the whole trip. You should be hearing the VCF with anything you route to the external input. “The EXT INPUT jack is routed to the VCF input. This was designed to take inputs from external synthesizers (Euro Rack Module, etc). Give it a test and send a gate to the gate or trigger input and some sound, any sound into the external input and mess with the filter. You should be getting filter. I don’t think there is a way at the moment to change this.